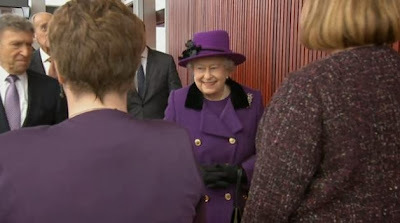 The Queen and the Duke of Edinburgh visited The Shard and Southwark Cathedral, Southwark, London. Click above for an article, photos, and video from the Daily Mail. I wondered why we didn't see an amethyst brooch on that lovely purple outfit from earlier this week, as we usually do - must have had it in reserve!